Flour is a finely ground powdery foodstuff obtained by grinding cereal grains or other edible, starchy portions of plants and used chiefly in baking. Flour is most commonly made from wheat and when the word "flour" is used without qualification, it usually implies wheat flour. However, flour also can be made from many other grasses and non-grain plants, such as rye, barley, maize (corn), rice, buckwheat, potatoes, beans, peas, and other foods, such as Australian species of acacia. Ground legumes and nuts, such as soy, peanuts, almonds, and other tree nuts, are also called flours. The same substances ground more coarsely are called "meal" instead of "flour." Human creativity is reflected in the production of flour, the many types of flours produced, and the diversity of baked foods that are prepared with flour. The use in breads, cakes, pies and other foods reflects not only people's physical needs (food for survival), but also their inner desire for joy. However, some flour processing methods have been developed that are economical but remove important nutrients. Regulations in many countries require that wheat flour be enriched with vitamins (niacin, riboflavin, thiamine) and iron, if not other nutrients, to replace nutrients lost in the production of refined flour. Most flour is made from wheat. Wheat flour is one of the most important foods in European and American culture, and is the defining ingredient in most types of breads and pastries. Bread, pasta, crackers, many cakes, and many other foods are made using flour. Wheat flour is also used to make a roux as a base for gravy and sauces. White wheat flour is the traditional base for wallpaper paste. It is also the base for papier-mâché. Cornstarch is a principal ingredient of many puddings or desserts. A wheat kernel contains three main parts (Blanchfield 2002). The bran is the outer covering of the kernel; it is high in fiber. The germ is the innermost part of the kernel; it is high in fat. Most of the kernel is the endosperm; it is high in carbohydrates and proteins. Whole wheat flour is made using all parts of the kernel, while white flour is produced using only the endosperm (Blanchfield 2002). Wheat is particularly useful for baking because it contains a large amount of gluten. Gluten is a composite of the proteins gliadin and glutenin. These exist, conjoined with starch, in the endosperms of some grass-related grains, notably wheat, rye, and barley. Gliadin and glutenin comprise about 80 percent of the protein contained in wheat seed. Gluten, which has strong elastic proteins, is what gives wheat dough an elastic structure that allows it to be worked in a variety of ways, and which allows the retention of gas bubbles in an intact structure, resulting in an aerated final product with a soft texture, desirable for breads, cakes and the like. Specifically, gluten forms a network throughout the dough, and traps gases formed by yeast, baking powder, or other leavening agents (Blanchfield 2002). In this case, the term yeast, which technically is a phylogenetically diverse grouping of single-celled fungi, refers to S. cerevisiae, or "baker's yeast" (Kurtzman 1994). In baking, it acts as a leavening agent, converting the fermentable sugars present in the dough into carbon dioxide. This causes the dough to expand or rise as the carbon dioxide forms pockets or bubbles. When the dough is baked it "sets" and the pockets remain, giving the baked product a soft and spongy texture. Many varieties of wheat exist for making flour, but in general, wheat that contains 11-18 percent protein is considered hard wheat and wheat containing 8 to 11 percent protein is called soft wheat (Blanchfield 2002). The higher percentage of protein in hard wheat means more gluten, allowing it to rise more than soft wheat flour. Cakes and pastry may be made from soft wheat and all-purpose flower has a blend of soft and hard wheat. The upper stone of a Scottish hand quern from Dalgarven Mill, North Ayrshire. Production of flour has taken place since prehistoric times (Blanchfield 2002). Earliest methods involved grinding between stones, such as mortar and pestle (stone club and stone bowl) and quern-stones (Blanchfield 2002). Quern-stones were made out of rock, with a horizontal, disk-shaped stone spinning on top of grain laying on top of another horizontal stone (Blanchfield 2002). The lower, stationary, stone is called a quern, while the upper, mobile, stone, which was spun around, is called a handstone. Another form, less useful for producing flour, was the saddle quern, which involved rocking or rolling the handstone using parallel motions (in other words, pushing and pulling the handstone), rather than spinning the top stone on the lower stone. These methods were generally replaced by millstones once mechanized forms of milling appeared, particularly the water mill and the windmill, although animals were also used to operate the millstones. Millstones consisted of a vertical, disk-shaped stone that rolled onto grain sitting on a horizontal, disk-shaped stone (Blanchfield 2002). The first mill in North America was powered by wind; it was built in Boston in 1632 (Blanchfield 2002). Modern processing involves many different processes, including grading the wheat, purifying the wheat, preparing the wheat for grinding, grinding the wheat, and processing the flour (Blanchfield 2002). Milling of flour is accomplished by grinding grain between stones or steel wheels. Steel-ground flour is produced by huge, high speed steel rollers or hammers, and the heat typically strips away the wheat germ ad destroys nutrients such as vitamins and enzymes (Herbst 2001). Stone-ground flour, which is naturally more nutritious, is produced by grinding the grain between two slowly moving stones (Herbst 2001). Many small appliance mills are available, both hand-cranked and electric. Various materials typically are added to the flour, including bleaching agents, oxidizing agents, vitamins, minerals, leavening agents, and salt (Blanchfield 2002). Bran that is removed during milling is used as a source of fiber for breakfast cereals and baked goods and as as feed for animals, while wheat germ that is removed during milling is used as a food supplement or source of vegetable oil (Blanchfield 2002). Flour dust suspended in air is explosive, as is any mixture of a finely powdered flammable substance with air. Some devastating and fatal explosions have occurred at flour mills, including an explosion in 1878 at the Washburn "A" Mill in Minneapolis, the largest flour mill in the United States at the time (MHS 2007). In medieval flour mills, candles, lamps, or other sources of fire were forbidden. Much more wheat flour is produced than any other flour. Wheat varieties are called "white," or "brown" if they have high gluten content, and "soft" or "weak flour" if gluten content is low. "Hard flour," or "bread" flour, is high in gluten, with a certain toughness that holds its shape well once baked. Soft flour is comparatively low in gluten and so results in a finer texture. Soft flour is usually divided into "cake flour," which is the lowest in gluten, and "pastry flour," which has slightly more gluten than cake flour. In terms of the parts of the grain (the grass seed) used in flour—the endosperm or starchy part, the germ or protein part, and the bran or fiber part—there are three general types of flour. White flour is made from the endosperm only. Whole grain or wholemeal flour is made from the entire grain including bran, endosperm, and germ. A germ flour is made from the endosperm and germ, excluding the bran. This flour is a blended wheat flour with an intermediate gluten level, which is marketed as an acceptable compromise for most household baking needs. It contains neither the bran nor the germ (Herbst 2001). This flour is treated with flour bleaching agents to whiten it (freshly milled flour is yellowish) and to give it more gluten-producing potential. Oxidizing agents are usually employed, most commonly organic peroxides like acetone peroxide or benzoyl peroxide, nitrogen dioxide, or chlorine. A similar effect can be achieved by letting the flour slowly oxidize with oxygen in the air ("natural aging") for approximately 10 days; however, this process is more expensive due to the time required. This is a flour with a maturing agent added. The agent's role is to help with developing gluten, a role similar to the flour bleaching agents. Bromate is usually used. Other choices are phosphates, ascorbic acid, and malted barley. Bromated flour has been banned in much of the world, but remains available in the United States. This is a special type of whole-wheat flour. The endosperm is finely ground, as in white flour, while the bran and germ are coarsely ground. Graham flour is uncommon outside of the USA and the cities of Romania. It is the basis of true graham crackers. Many graham crackers on the market are actually imitation grahams because they do not contain graham flour or even whole-wheat flour. This flour has slightly higher gluten content than cake flour, but lower than all-purpose flour. It is suitable for fine, light-textured pastries. This flour is made of durum wheat. It has the highest protein content, and it is an important component of nearly all noodles and pastas. It is also commonly used to make Indian flatbreads. Corn (maize) flour is popular in the Southern and Southwestern United States and in Mexico. Coarse whole-grain corn flour is usually called corn meal. Corn meal that has been bleached with lye is called masa harina and is used to make tortillas and tamales in Mexican cooking. Corn flour should never be confused with cornstarch, which is known as "cornflour" in British English. Buckwheat flour is used as an ingredient in many pancakes in the United States. In Japan, it is used to make a popular noodle called Soba. In Russia, buckwheat flour is added to the batter for pancakes called blinis which are frequently eaten with caviar. Buckwheat flour is also used to make Breton crepes called galettes. Chestnut flour is popular in Corsica, the Périgord, and Lunigiana. In Corsica, it is used to cook the local variety of polenta. In Italy, it is mainly used for desserts. Atta flour is a wheat flour which is important in Indian cuisine, used for a range of breads such as roti and chapati. Tang flour (not to be confused with the powdered beverage Tang) or wheat starch is a type of wheat flour used primarily in Chinese cooking for making the outer layer of dumplings and buns. Glutinous rice flour or sticky rice flour, used in east and southeast Asian cuisines for making tangyuan, and so forth. Potato flour is obtained by grinding the tubers to a pulp and removing the fiber by water-washings. The dried product consists chiefly of starch, but also contains some protein. Potato flour is used as a thickening agent. When heated to boiling, food added with a suspension of potato flour in water thickens quickly. Because the flour is made from neither grain nor legume, it is used as substitute for wheat flour in cooking by Jews during Passover, when grains are not eaten. Amaranth flour is a flour produced from ground Amaranth grain. It was commonly used in pre-Columbian Meso-American cuisine. It is becoming more and more available in specialty food shops. Nut flours are ground from oily nuts—most commonly almonds and hazelnuts—and are used instead of or in addition to wheat flour to produce more dry and flavorful pastries and cakes. Cakes made with nut flours are usually called tortes and most originated in Central Europe, in countries such as Hungary and Austria. Flour can also be made from soy beans, arrowroot, taro, cattails, acorns, peas, beans, and other non-grain foodstuffs. 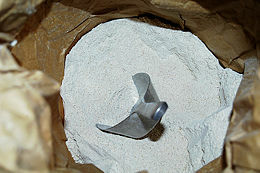 In some markets, the different available flour varieties are labeled according to the ash mass ("mineral content") that remains after a sample was incinerated in a laboratory oven (typically at 550 °C or 900 °C). This is an easy to verify indicator for the fraction of the whole grain that ended up in the flour, because the mineral content of the starchy endosperm is much lower than that of the outer parts of the grain. Flour made from all parts of the grain (extraction rate: 100 percent) leaves about 2 grams ash or more per 100 grams dry flour. Plain white flour (extraction rate: 50-60 percent) leaves only about 0.4 grams. It is possible to find out ash content from some US manufacturers. However, US measurements are based on wheat with a 14 percent moisture content. Thus, a US flour with .48 ash would approximate a French Type 55. In general, as the extraction rate of the flour increases, so do both the protein and the ash content. However, as the extraction rate approaches 100 percent (whole meal), the protein content drops slightly, while the ash content continues to rise. This table is only a rough guideline for converting bread recipes. Since the American flour types are not standardized, the numbers may differ between manufacturers. Blanchfield, Deirdre S. 2002. How products are made. an illustrated guide to product manufacturing volume 7. Detroit: Gale Group. ISBN 0787636436. Kent, N. L. 1975. Technology of Cereals With Special Reference to Wheat. New York: Pergamon Press. ISBN 0080181759. Kurtzman, C. P. 1994. Molecular taxonomy of the yeasts. Yeast 10(13): 1727-1740. Retrieved December 22, 2007. Minnesota Historical Society (2007). Washburn "A" Mill Explosion. Minnesota Historical Society Library History Topics. Retrieved December 22, 2007. Sokolov, R. 1994. Through a mill, coarsely. Natural History (February 1994): 72-74. Wrigley, C. W. 1996. Giant proteins with flour power. Nature 381: 738-739. This page was last modified on 14 April 2017, at 19:37.